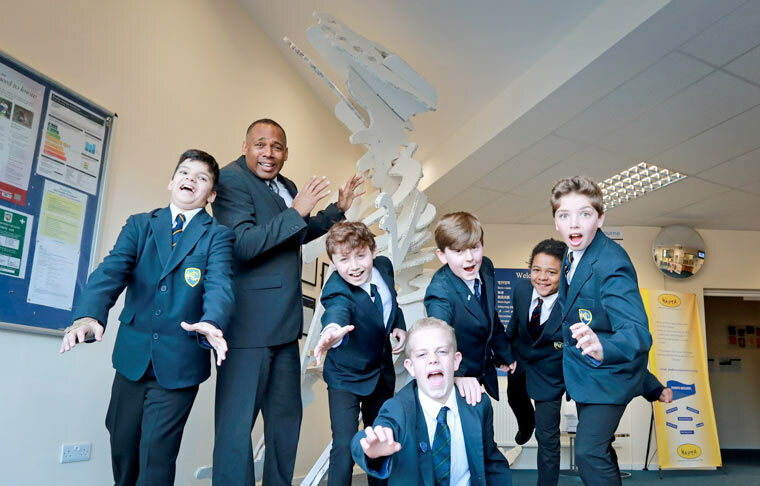 Students at Harewood College went back to Jurassic times and created a giant dinosaur sculpture which is currently on display in their reception area. A whole week scientific activities at Harewood College transformed the Bournemouth school, which is part of the Avonbourne Trust, into Jurassic Harewood as students turned the clock back by millions of years. From building their very own dinosaur skeleton to a prehistoric themed orienteering course, the boys used their scientific skills to learn about the time before man existed. Principal of Harewood College, David Bromfield, said: “We are always looking at creative ways to bring the curriculum to life for our students, inspiring their wonder and intellectual curiosity. Harewood’s Jurassic themed activities were held as part of National Science Week. Activities included a Bournemouth University led giant dinosaur skeleton model making event, a talk by fossil expert Steve Limburn from the Bournemouth Natural Science Society, a visit to the Being Human day at Bournemouth University, fossil making and a dinosaur-themed quiz. As part of science week, students in Years 7, 8 and 9 also took part in an orienteering event around the school grounds when they navigated using a map to gather information on prehistoric creatures including their size, weight, habitat and diet. The week culminated in a science evening with demonstrations by teacher James Livermore. CEO of Avonbourne Trust, Debbie Godfrey-Phaure, said: “This was an incredibly well-run and exciting event for our students. “I’d like to thank all the teachers for their hard work in organising the event and to Bournemouth University and Bournemouth Natural Science Society for their contributions.